FitBit: As an unexpected thank you to the 3 employees helping me lead my company’s wellness program, I gave them the option to purchase either a Fitbit or Polar device. At the time, Fitbit had just recalled their (then) most data heavy wellness tracker – the Fitbit Force, so the best next option was the Fitbit Flex. While the Flex doesn’t monitor continuous heart rate (con), doesn’t have a watch on its face (con) it did offer a sleep tracker, GPS (you have to bring your smart phone with you on those bike rides and runs) and it is lightweight. Read the techradar.com review of the Flex. 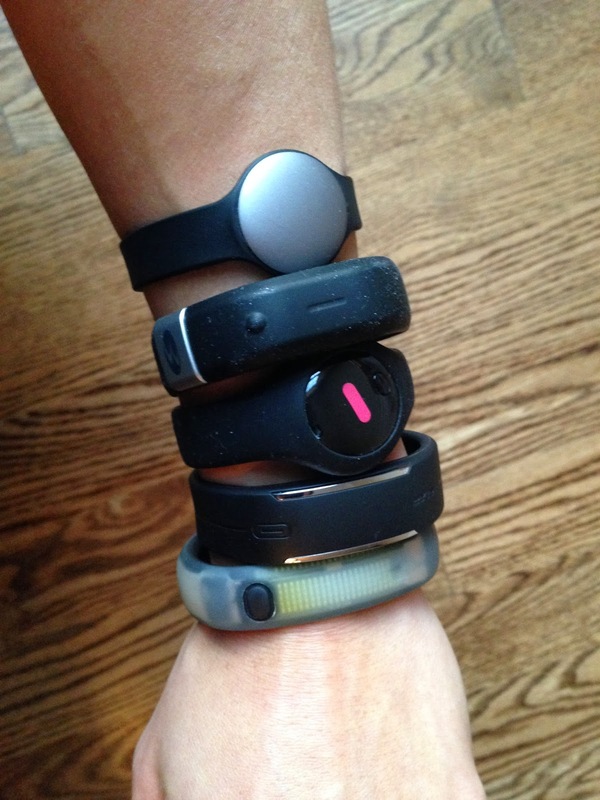 I still wear my Flex and will continue to do so until I upgrade to a new, more all-encompassing wellness wearable. Polar FT4: This seemed like another viable wearable option because the device touted it’s ability to track and monitor heart rate. Sounds awesome right? The caveat is that you have to wear a heart monitor band around your chest during all your workouts or all of the time in order to collect your heart rate data. There was no way I was going to wear something tightly strapped around my entire upper body. I don’t even like wearing constricting sports bra because they don’t allow me to take deep, full breaths while huffing and puffing to keep my mile under 10 minutes! Read the review from runners101.com. I originally looked into this device in June 2014; Polar has since upgraded all of their devices and the heart rate band isn’t required for all heart rate data tracking as of Fall 2014. Movable (pronounced Move – a – bul): This device, making waves in it’s parent company city, Cleveland, Ohio popped up on Forbes Entrepreneurs list in the summer of 2013. Where FitBit and most other basic pedometers track number of steps taken, Movable tracks total moves made by the wearer. This comes is handy for those of you who aren’t runners, but prefer activities like spin or kickboxing. FitBit and Polar track distance gained by the wearer but Movable tracks ALL moves made and with a complicated, but pretty awesome algorithm, Movable looks at a more complete fitness picture of the wearer by giving you kudos for all movement that you make during the day. This product is still pretty new to the market and still needs more time in development to make it a heavy contender against the likes of the Fitbit or Polar, but I’m looking forward to the changes coming out in late Q1 of 2015 as well as the release of the 2nd generation device. No well-rounded wellness device comparison would be complete without pitting the two hardware giants, Microsoft and Apple, against each other in The Battle of the Wellness Devices… unfortunately, I have not been privy to test out the Microsoft Band or the Health component of the iWatch – errrrrr, “Apple Watch,” so you will have to take the word of Gigaom’s Kevin C. Tofel’s and tech.radar.com’s Gareth Beavis’s opinions on each device. So, to all you HR health and wellness junkies out there, you are now armed and ready to take your wellness programs to the next level by incorporating wearable fitness devices into your culture of health and wellness. Shoot me an email or ping me on LinkedIn if you want a more in-depth account of how I built my company’s wellness program from scratch and incorporated wearables as a program component. Warning: this type of program design/implementation/management this is not for the faint of heart. *It is imperative that as an employer, you do not collect personal health-related data! Follow all HIPAA, GINA and ERISA regulation behind protected health information – data should be available for the participant’s eyes ONLY. Credits: As always Gigaom & my current tech blogger #mcm Kevin C. Tofel, new kid on the wellness device block Gareth Beavis, the team over at techradar.com and Rob at Movable for taking the time to walk me through the online Movable platform and for hooking me up with gear to beta test the device for 2015. This entry was posted in Employee Engagement, Human Capital Management, Wellness Program and tagged #mcm, Apple Watch, engagement, Fitbit, Gigaom, health and wellness, Kevin C. Tofel, technology, wearable wellness. Bookmark the permalink. ← In the Age of Wisdom and Foolishness, Are We Forgetting About Work-Life Balance?